Discover our latest range of beautifully tactile tableware. Our afternoon tea collection is manufactured to the highest specifications. British design and innovation hand crafted for over 40 years. Luxury silverware internationally renowned for the highest quality. A relaxed and stylish range of tableware 100% recycled. Made to the highest quality, classic and contemporary patterns in a range of finishes to suit any relaxed dining or formal environment. Heritage Collection is a leading manufacturer of tableware, supplying innovative tableware solutions to the Hospitality and Catering Industry. We are a family run business, founded in 1976 as Heritage Silverware. Over the years, we’ve developed our product range so it now covers tableware across the board. We offer cutlery, restaurant cutlery, afternoon tea service, porcelain, glassware, stoneware, trolleys, fine bone china, glass, cast iron and more. We work closely with chefs, hotels & restaurants, tailoring our tableware so that it fits perfectly with the menu, aesthetics and overall vision of an establishment. We are lucky enough to work with many of the UK’s Michelin starred restaurants as well as top hotels like The Ritz and The Dorchester. Our core belief in British craftsmanship has supported the continued development of our manufacturing capabilities in the heart of Birmingham in the UK. We still employ many of the same skilled craftspeople now as we did 40 years ago! Combining traditional skills and techniques with advanced technology, enables us to create unique, bespoke tableware products for our customers. 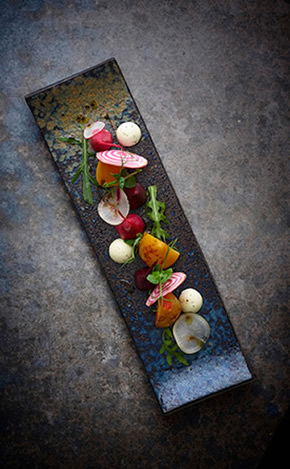 We are continually innovating and developing new and interesting tableware solutions.